So you've built an app or a website or a channel with excellent social interactions. Whether you meet your audience on Twitter, Facebook, LinkedIn or Instagram, you are missing valuable data from your users that will increase conversions. Anyone can call themselves a social media expert these days -- but what really separates the wheat from the chaff is whether you know how to spin those social media analytics into gold. The good news? We're here to help. We've gathered data from our own VB Insight reports, and selected two experts who have built their business on the backs of their social media empires. They have the goods. Now it's your turn. 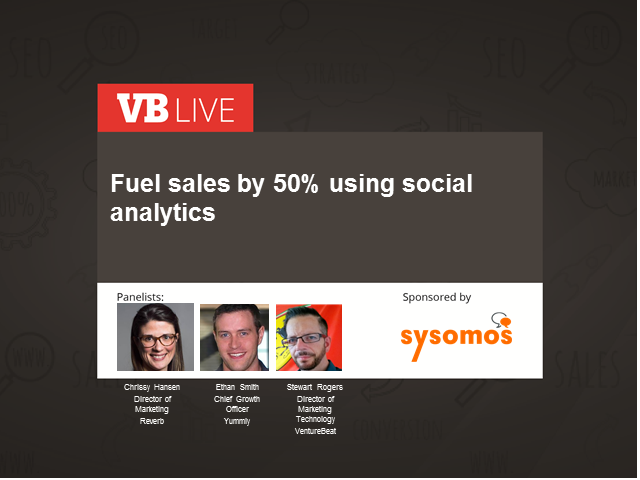 In this free webinar, join VB's own Stewart Rogers, Chrissy Hansen, Director of Marketing, from Reverb and Ethan Smith, Chief Growth Officer, from Yummly experts as they explore the impacts (good and bad) of social analytics on everything from apps to mobile to websites.